If you have ever asked, "Can a dog die from eating chocolate?," the answer is yes. A dog can die from eating chocolate, but there are many factors to take into consideration. Really, Can a Dog Die From Eating Chocolate? Is feeding your dog chocolate worth the chance that he will get sick or even die? What Makes Chocolate Toxic for Dogs? There are two substances that can cause problems in a dog's system. Chocolate contains these substances in various amounts depending on the type. Theobromine is also known as xantheose. It is a bitter alkaloid that is found in chocolate, coffee, tea, guarana, and other products. 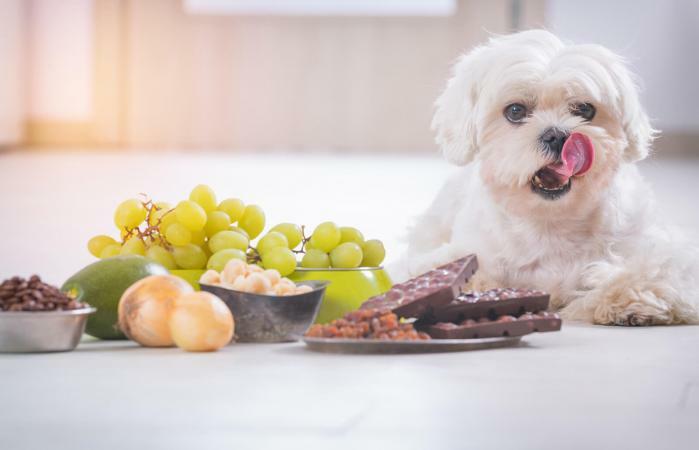 Dogs and some other animals metabolize theobromine very slowly, and this gives it a chance to have more of an effect on their organs. Caffeine is a little different than theobromine although it is related to it. Caffeine disrupts the nervous system and may cause the animal's heart to race. Different types of chocolate have different levels of toxicity. As you can see from the chart, the purer the chocolate is, the more toxic it is. Straight cocoa powder or cocoa mulch can be much more dangerous in small quantities than white chocolate or milk chocolate. You use the guidelines below or a chocolate toxicity calculator which looks at the danger based on the weight of your dog and the amount and type of chocolate. If your dog has eaten chocolate, he may have some of the following symptoms. It is very important that you take him to your vet immediately if you suspect he may have ingested chocolate. The symptoms can show up in as little as an hour and continue to worsen as the dog digests and metabolizes the chocolate. If your dog may have eaten chocolate and experiences some of the symptoms listed, you should call your vet immediately. If your vet advises you to bring your dog in, do so right away rather than looking for home remedies. This is the best way to find out how to treat a dog that ate chocolate. You should also try to force your dog to vomit if you can do so safely. It is important to get as much of the chocolate as possible out of his system as quickly as you can. Make sure he has access to plenty of water to keep him flushed out and make sure he does not become dehydrated. If your dog ate chocolate 24 hours ago, and you have seen none of the symptoms, the best course of action is to call your vet or the poison hotline. If your dog has eaten under the minimum problematic amount, and he seems fine, it's likely your vet will advise you to keep an eye on him and keep him home. Feed him a bland diet in small portions, a reduce amount of water and call your vet if his diarrhea continues for more than a day. There can be long-term effects on your dog if he has eaten chocolate and is not treated. Chocolate will continue to metabolize for up to 24 hours in your dog's stomach. Getting it out as quickly as possible is the key to keeping him from experiencing long-term ill effects. Some of these effects include kidney damage or cardiac problems. Can a dog die from eating chocolate? Yes, he can, but that doesn't mean that the situation has to turn out that way. With quick action and careful observation, your dog can survive a chocolate eating episode just fine.